Some of the most daunting and awe-inspiring landscapes in England lie just minutes from this neat town in Derbyshire’s High Peak. 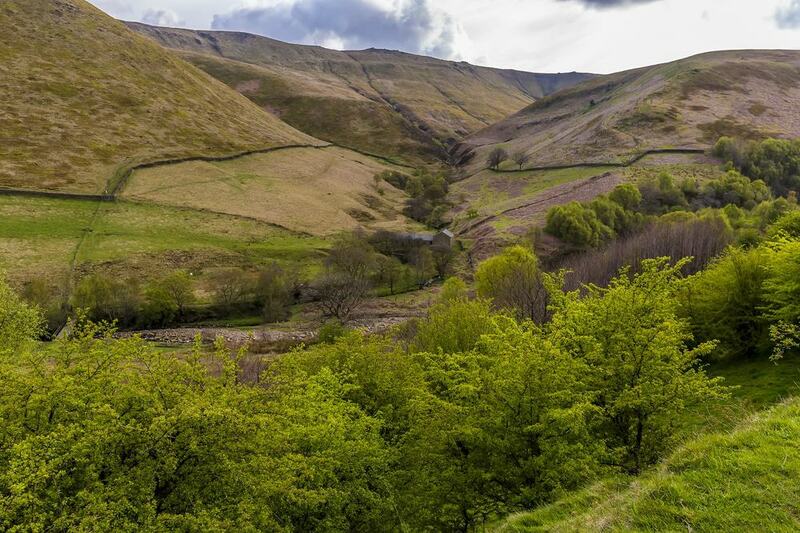 Glossop is on the western boundary of the Peak District National Park, at a tangle of walking routes like the Trans Pennine Trail, the Pennine Way and the Longdendale Trail. 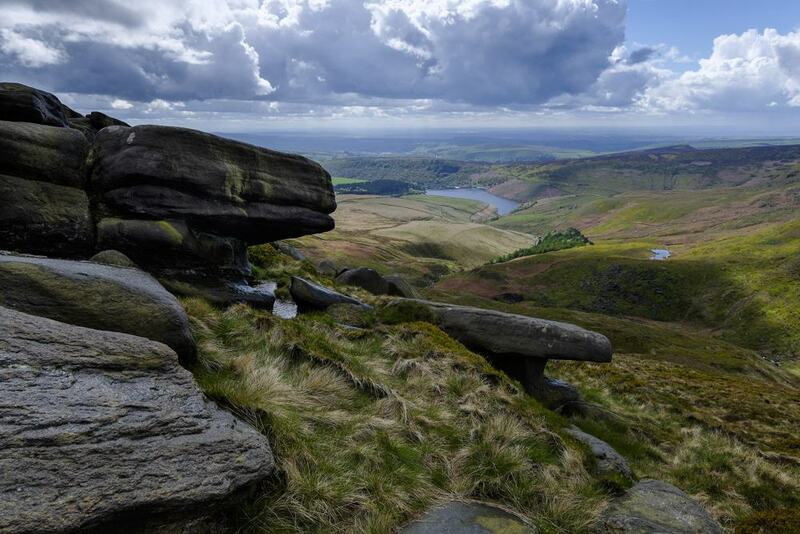 Adventurers won’t resist the call of the Dark Peak’s moorland and will battle across plateaus decked with peat bog and up centuries old packhorse roads in scenery to remember for a lifetime. In the 19th century Glossop was run by cotton entrepreneurs, and signs of Victorian industry aren’t hard to find. 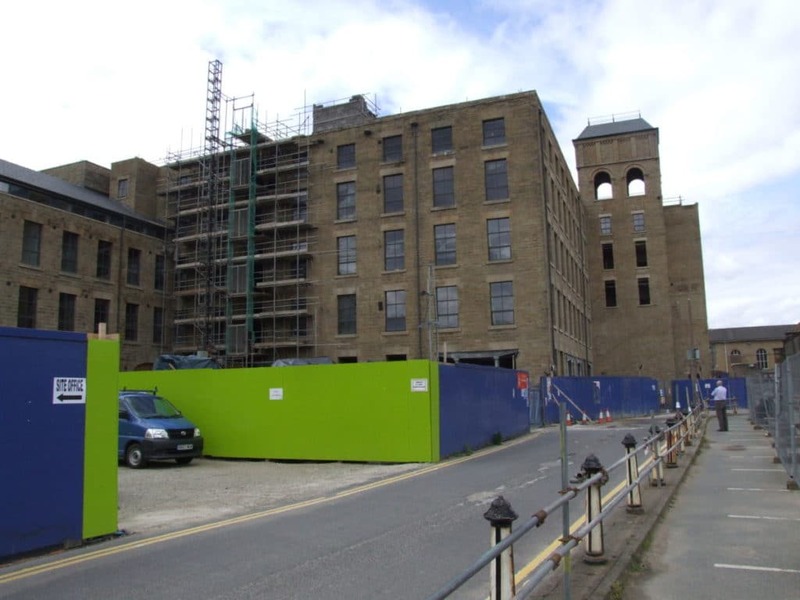 Two former cotton mills have been repurposed for the 20th century as pubs, hotels and shops, while Glossop’s parks were donated by mill owners. The upper reaches of the Peak District are known as the Dark Peak. That ominous name describes an underlying layer of millstone grit, which traps water on the surface of the moors in blanket bogs. The terrain is harsh but beguiling for its muted colours, distant vistas and relict oak-birch woodland hiding from the wind in little cloughs. In August there are flecks of purple against the browns and greys of the moors when the heather comes into flower, and this is a fine time to be in the Dark Peak. At Glossop you’re at the foot of the Snake Pass, in a prime position to lace up your boots and go walking. There’s no question that the Dark Peak can be gruelling, but a section of the coast-to-coast Trans Pennine Trail through Glossop is actually quite light underfoot. 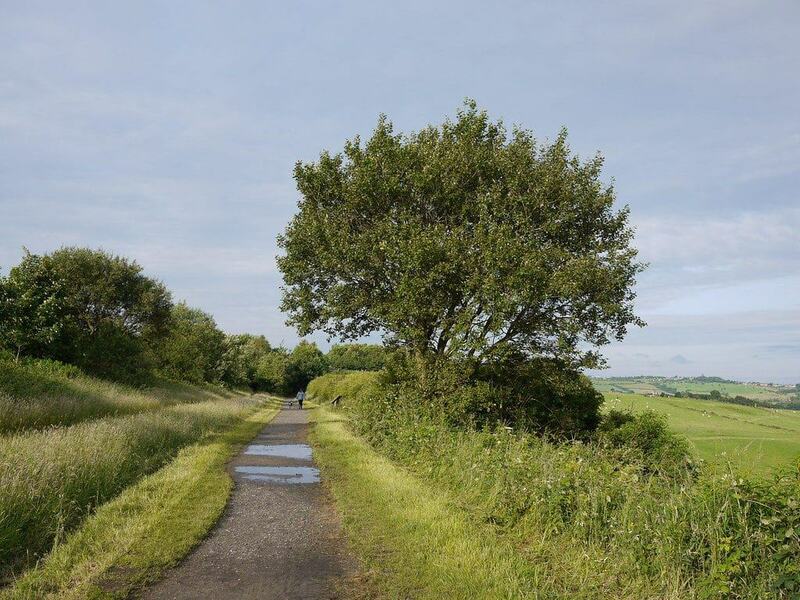 This is the Longendale Trail, using the former trackbed of the long defunct Woodhead railway line, which used to run between Sheffield and Manchester and closed for good in 1981. The trail is 6.5 miles between Padfield and Penistone, with light slopes and a hard surface suited for carefree family bike rides. 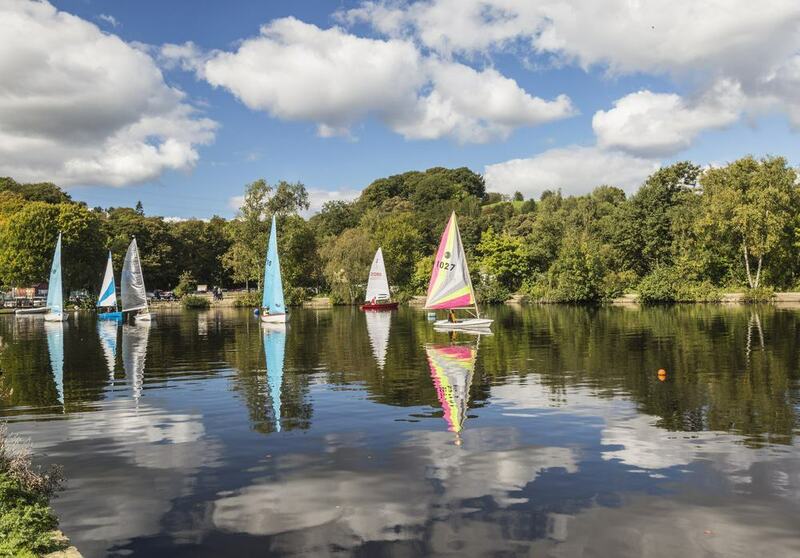 The route carries you through the epic Longendale Valley and past a string of six reservoirs on the River Etherow. You can take the pulse of Glossop on its High Street, which has a lot to love. In between a few chain stores the High Street has independent butchers, bakeries, delicatessens and fashion shops and cafes. There are lots of pubs and places to eat, both on the High Street and intersecting roads. 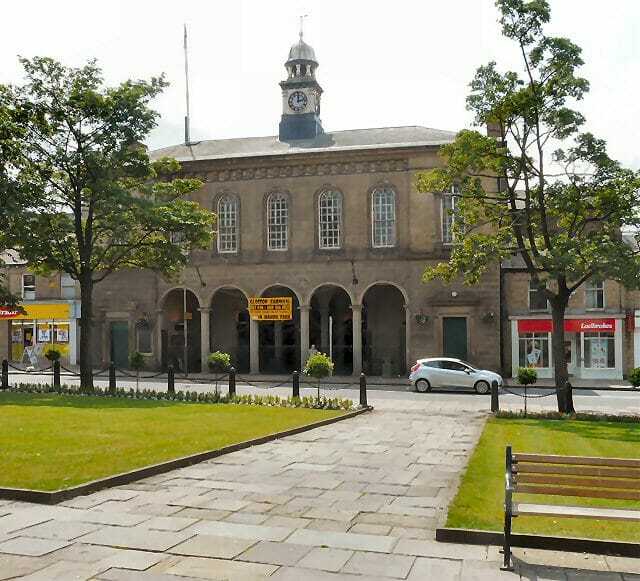 With neat formal lawns and a war memorial, Norfolk Square is fronted by the solemn Partington Players Theatre (a great place to catch an independent movie) and Glossop Town Hall. That Italianate building was completed in the late-1830s and has arcades leading into the Market Hall. At Torside the Pennine Way turns south and climbs onto the gritstone moorland of Bleaklow. The moorland rises to 633 metres at the summit, Bleaklow Head, which is marked with a large cairn. From this point you can see as far as Snowdonia (94 miles away!) on the clearest days. This is the second highest point in all of Derbyshire and is not for greenhorns. Without any sudden changes of elevation Bleaklow is notoriously difficult to navigate, not least because of thick mist. It is also wet, with huge swathes of bog, and where the peat drains there are “groughs”, sudden valleys that give the moor a pitted aspect. The mournful quality of this landscape is summed up by the wreckage of the B-29 Superfortress “Overexposed”, which crashed here in low cloud in November 1948, killing all 13 crew members. The Pennine Way will lead you to the highest point in the whole of the Peak District, sitting five miles from Bleaklow as the crow flies. 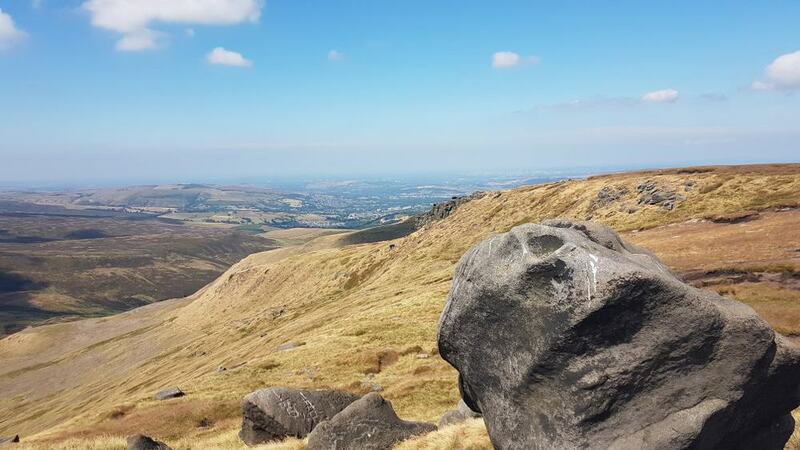 Like Bleaklow, Kinder Scout is a moorland plateau, cresting at 636 metres and like its neighbour to the north has views that will leave you speechless if you catch the right weather. The land is owned by the National Trust, and in 1932 witnessed a turning point in ramblers’ rights, when a mass trespass was staged here to protest the lack of access for walkers to large areas of the English countryside. The River Kinder rises on the moor and flows off a gritstone cliff on the west edge at the Kinder Downfall. Thirty metres high, this is the tallest waterfall in the Peak District. Legend has it that the “Mermaid’s Pool” is inhabited by a mermaid who will grant immortality to anybody who spots her on Easter Eve. Heading to Kinder Scout you could start a walk to Jacob’s Ladder from the village of Hayfield, which is just ten minutes south of Glossop by car. 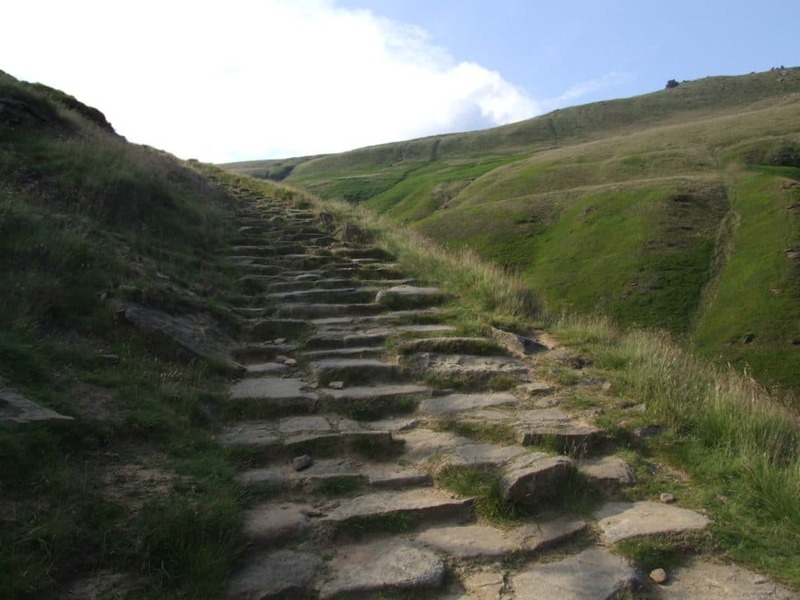 But there’s a rewarding walk to the summit if you begin at the village of Edale, which requires a bit more of a drive. The journey is worth the effort because Jacob’s Ladder is a challenge to savour. This path was laid during the pre-industrial packhorse era in the 17th and 18th centuries. At the foot of the slope there’s a stone packhorse bridge and behind it an old paved road zigzags up the slope to make the climb a bit less onerous for horses. The walk isn’t easy but the scenery from the trig point at the top will make you forget your burning calves. 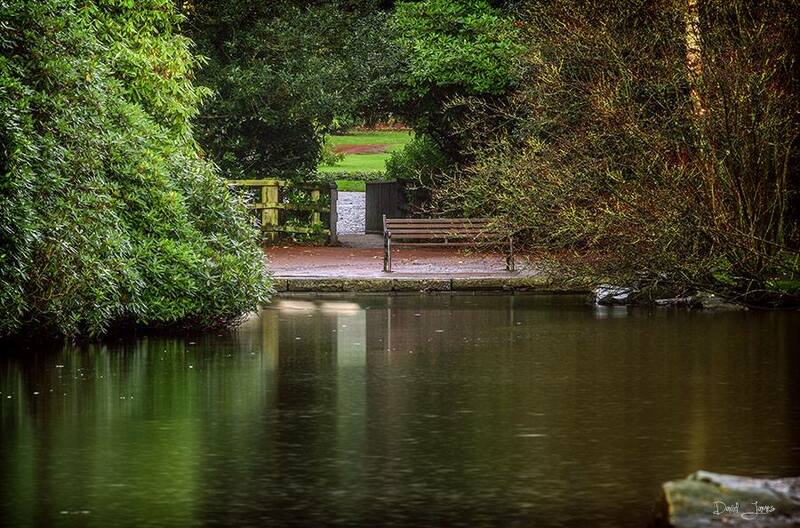 Therapy for aching feet, Manor Park is a genteel urban park next to Old Glossop’s conservation area. This was the site of the Manor House owned by the landowning Howard Family, which controlled Glossop’s cotton milling industry for decades. The park was given to the town in the 1920s and boasts a collection of mature trees, formal gardens and features like a man-made waterfall left over from the estate. Manor Park also has a lake, bowling greens, tennis and basketball courts, a skate park, miniature golf course and miniature railway running on weekends in summer and every day during the school holidays. 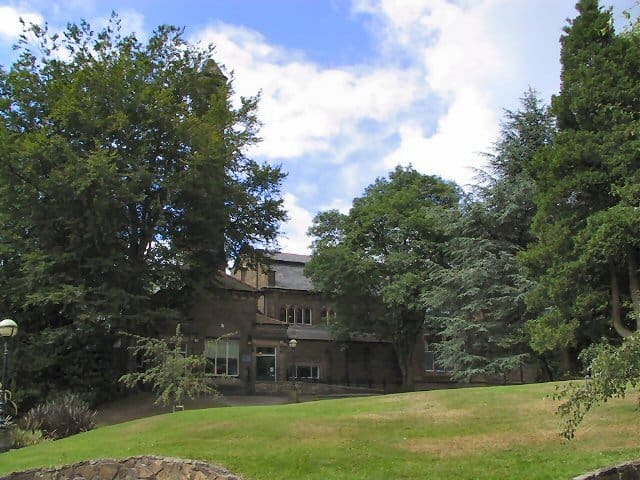 This Victorian park in the north of Glossop is its own conservation area. Howard Park was inaugurated in 1888 to mark Queen Victoria’s Golden Jubilee. The cotton industrialists, the Wood family put up funds for the project, while Lord Howard of Glossop donated the 12 acres of land, which still includes a former reservoir at the south end. Set in a natural ravine, Howard Park’s free-flowing landscaping by Henry Ernest Milner survives from the 1880s. Also original is the handsome Victorian bathing hall containing Glossop swimming pool. A waterway often hailed as the most beautiful in England is in striking distance to the west of Glossop. 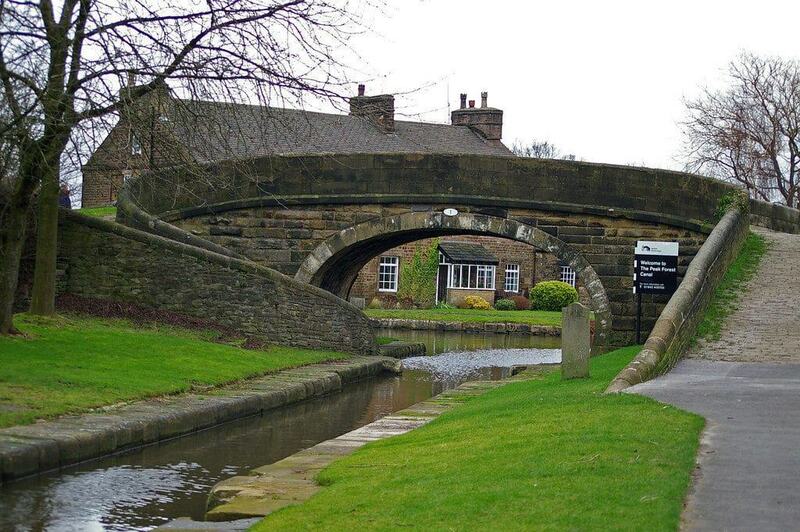 The Peak Forest Canal has a walkable towpath and was totally restored for boats in the 1970s. It starts in Ashton-under-Lyme, to the northwest, and snakes along the western foot of the Peak District for 15 miles down to Buxworth. If you have to see one thing on the Peak Forest Canal, make it the spectacular Marple Lock Flight. Here a sequence of 16 locks lifts helps the canal climb a total of 64 metres in the space of a mile. For most of the route the canal runs next to the wildlife-rich River Goyt. At Marple the waterway crosses the river in unforgettable style at the Marple Aqueduct before arriving at the foot of the locks. Walking distance from the Marple Aqueduct, Etherow Country Park is at a former industrial site close to where the River Etherow flows into the Goyt. In the 19th century there was a mine and a cotton mill on this spot. The mill was powered by water stored at the mill pond, replenished by the River Etherow. This reservoir is now strictly for pleasure, and home to the Etherow Country Park Sailing Club for more than 50 years. More than 100 bird species have been sighted from the lake’s banks, while the 32-acre Compstall Nature Reserve within the park has been declared a Site of Special Scientific Interest for its reed beds, tall fens, open water and mixed deciduous woodland. A titanic piece of railway infrastructure built for the Woodhead Line in 1844, the Dinting Viaduct is still part of the mainline network and traverses the Dinting Vale and Glossop Brook at the nearby village of Dinting. Carried by giant brick and stone piers, the structure has 16 arches and is 370 metres long. 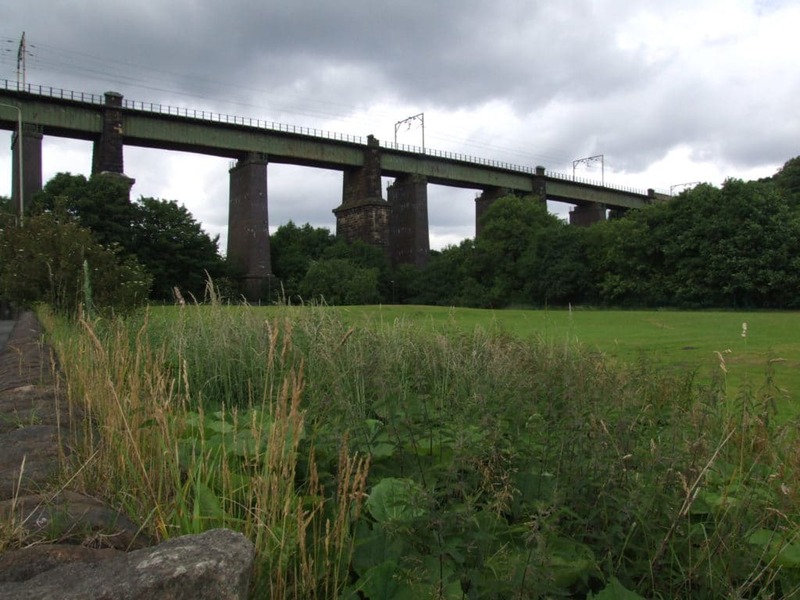 To gauge the full size of the viaduct there’s a small grassy area off the A57 next to the Glossop Brook. You could also catch the train from Glossop to Broadbottom via Dinting to savour the view over Glossopdale. 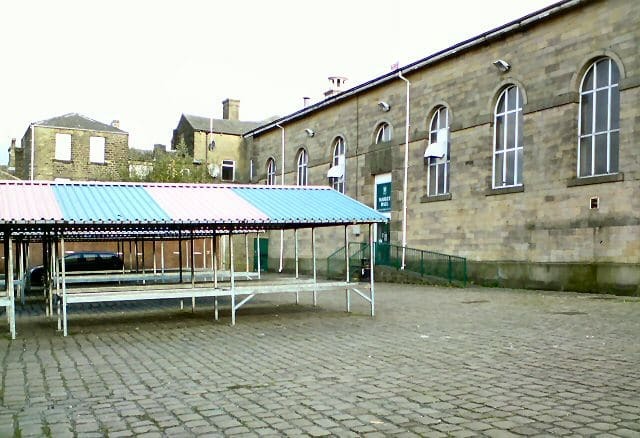 Through the town hall’s arches, Glossop Market trades on Thursdays, Fridays and Saturdays and has a diversity of stalls. You can pick up fruit and vegetables, arts and crafts, beauty products, pet supplies, vintage textiles, carpets, artisan coffee, retro kitchenware, fresh muffins, t-shirt printed to order, antiques and local meat from Robinson’s Butchers. Saturday is the best day to visit, when the market overflows onto the cobblestone square behind. On the west end of the High Street is a solemn industrial landmark. 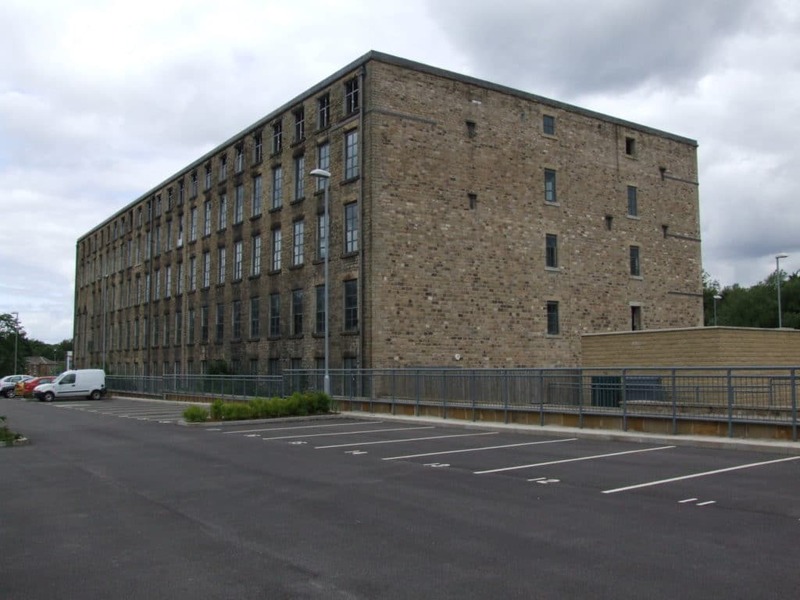 The Wren Nest Mill was built in the 1810s by the Catholic entrepreneur Francis Sumner, and in its heyday this cotton spinning mill employed over 1,100 people who operated some 123,000 spindles and more than 2,500 looms. The once vast enterprise stopped trading just after the Second World War, and a lot of the complex was lost in a fire in 1996. Right on the Glossop Brook, the surviving cuboid building now has 72 luxury flats and shops on its ground floor as part of the Wren Nest Retail Park. In the last decade a mammoth Georgian cotton mill just off the High Street has been given a new lease of life as the anchor for a shopping park. This five-storey building dates to the start of the 19th century and was equipped with a steam engine and power looms after 1825, becoming the largest cotton mill in the town. Following a multimillion-pound redevelopment this evocative building now contains upmarket apartments on its upper floors, as well as a branch of Wetherspoons and a Travelodge. Starting on the May Bank Holiday weekend and lasting for a week, Derbyshire Open Arts is a county-wide arts and crafts festival. At this “Open Studio” event artisans and artists either welcome people into their studios or put their work on show at public venues. As you’d imagine, there’s a big variety of participants, from painters to ceramicists, jewellery-designers, textile artists, photographers, glassmakers or printmakers. In 2018 four venues participated in the Glossopdale area – Brook Street Studios, the Oakwood Pub, The Craft Barn in Hadfield and the “Simon Parkin Artist” on Glossop High Street. These are just four of well over 100 across the county, and access to all the exhibitions is free.